CARFAX 1-Owner, Superb Condition, GREAT MILES 31,511! Turbo S trim, Agate Gray Metallic exterior and Black interior. Moonroof, Nav System, Heated Leather Seats, All Wheel Drive, Power Liftgate, Aluminum Wheels, Quad Bucket Seats, Turbo Charged Engine, Non-Smoker vehicle, Edmunds.com explains "All four seats are similar in appearance and comfort, with integrated headrests and excellent support for both aggressive cornering and long-distance touring.". Leather Seats, Navigation, Sunroof, All Wheel Drive, Quad Bucket Seats, Power Liftgate, Heated Driver Seat, Heated Rear Seat, Turbocharged, Premium Sound System, Satellite Radio, iPod/MP3 Input, Bluetooth®, Aluminum Wheels, Keyless Start. Rear Spoiler, MP3 Player, Keyless Entry, Remote Trunk Release, Child Safety Locks. Porsche Turbo S with Agate Gray Metallic exterior and Black interior features a 8 Cylinder Engine with 570 HP at 6000 RPM*. Non-Smoker vehicle. Edmunds.com's review says "All four seats are similar in appearance and comfort, with integrated headrests and excellent support for both aggressive cornering and long-distance touring.". Approx. Original Base Sticker Price: $180,300*. Welcome to Galpin Ford! 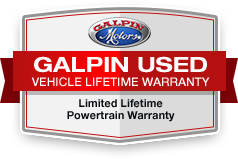 Located in North Hills, CA, Galpin Ford is proud to be One of the premier dealerships in the area. From the moment you walk into our showroom, you'll know our commitment to Customer Service is second to none.